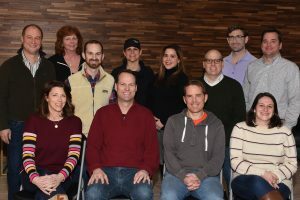 Our annually elected Board of Director volunteers come from a wide variety of backgrounds, enhancing our ability to effectively address the needs of the Mt Lookout community. We have designated team leaders for various short and long term projects including Square redevelopment, Luminaria, communications, Mt. Lookout Business Association liaison, etc. Front row (from left): Laura Whitman, John Brannock, Dan Prevost, Alexis Morrisoe. Back row (from left): Brian Spitler, Kim Rice, Tyler Musial, Abbey MacWilliams, Katya Ramos, Rob Pasquinucci, Mike Tranter, Nick Steinert. Not pictured: Cathy Schildknect.